Are Facebook, Twitter, And Other Social Networks Just Internet Noise? 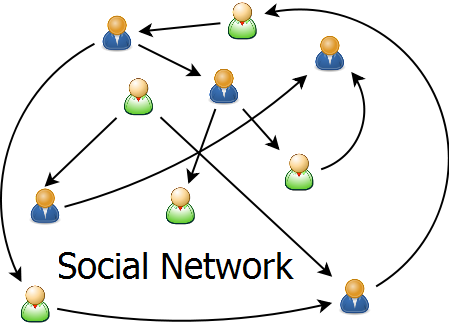 In last 5 years, we have seen an explosion in the use of social networks. Nearly everyone today from kids to grandmothers have a Facebook account. Twitter has really come on as a quick way to receive status updates, or express yourself in 140 characters or less. :) When you really think about it, its pretty amazing how connected we are in the world today. As the graphic above shows, what 15 years ago took a day or two to be known around the world can now be known in a matter of minutes. However, with all this information at the tips of our fingers with Social Networks, how much of it is actually useful and how much of it is just useless noise? In today's world of "very short attention spans" if you have a Facebook brand page, how many users are really reading your posts, interacting with your brand? or using Facebook to influence a sale? I subscribe to the theory that useless information holds very little value. Social networks today, in my opinion, are flooded with useless internet noise. According to a study by San Antonio based marketing research firm named Pear Analytics 40% of tweets on Twitter consist of useless pointless babble, and another 38% is just basic conversational, with other 22% being news, spam, self promotion, and pass-along. It would be fair to assume Facebook is probably pretty close to these same numbers. As on a daily basis iI see posts of pictures with Internet meme's on them, recipes, ad's for Facebook games my friends are playing, and other useless information. So its required to sift though roughly 78% of the useless information just to get to the 22% that a person may find useful. Of course most social networks allow you to hide posts, unfriend, or in some other way ignore the stuff your not interested in, but this becomes an ongoing affair that becomes more of a chore then actually enjoying these services. As a small business, its a safe bet to say that as Elen Dekel of Forbes points out in his experiences, a Facebook brand page could be a huge waste in resources and manpower that could be used elsewhere. The same could also be said of a Twitter account, as you still have to commit resources to it, and hope your followers, who have increasingly small attention spans due to internet noise that has overtaken social networks, will pay attention to your brand. I know I have touched on small attention spans of users in this post, but my intent is not to insult, to the contrary, its the complete opposite. People are busy in today's world, more people access the web with mobile devices then ever before, they simply just don't have the time to sift though all the useless pointless babble to notice your brand that they have to scroll forever to get to. This is unfortunately a simple truth. If we take all of this into consideration, we also have to consider Facebook's newest news feed update that has caused business pages to lose about 44% of their their organic reach according to Ignite Media and Web Pro News. So after dealing or trying to sift though all the noise, brands are forced to cope with this as well which just means your posts won't reach as many users unless you pay for advertising. Facebook is a business, they are in it to make money, I am not going to fault them for this, it just means your going to have to invest some cash if you want a serious return or engagement. Now don't get me wrong, I am not anti-social network, I have a Facebook account I use to keep in touch with family and friends, but I have found in the last two years I don't use it as much as I use to for a vareity of reasons. I feel social network sites have lost their way, It may not even be fair to refer to them as Social Network sites anymore. They have become more and more used as a form of News Media and press coverage then standard Social Networking use. The major news organizations all use Social Networks such as Twitter to push viewers to their news stories. In essence the news media has essentially commandeered Social networks. If its not news organizations, then its businesses posting things. I thought social networks were designed for "people and individuals" to communicate with each other, Not as a platform for news agencies and businesses to push their stories and products on the users. If a user wants the latest news, would he or she not visit the site in question? or Google it? Newspapers and news networks complain about lost revenue and dwindling advertising on the web side, yet they post their stories on social media where users can get the gist of the story and probably 50% of them decide not to even bother clicking on the link to the news site to read more(and be exposed to ads) because they got the gist of the story from the social media snippet. So those users never get the ads in front of them to begin with. In closing, I think it would very prudent if your a small business, and your thinking about having a social media presence, that you should sit down and really evaluate if its worth it to have such a pretense. Its important to take the roughly 78% useless internet babble into consideration, that your going to hope your users wade though, to engage with your brand. Its so hard to get and keep a users attention on these social networks. When looking at search engines like Google, visitors are "Searching" for what you are offering. Its going to be easier to keep that users attention, or perhaps get a sale. Social networks on the other hand, may have a much steeper cost in manpower, time, and money in comparison to ROI that it just may not be worth it.